Do metamorphic proteins mediate evolutionary structural transitions? On several previous occasions on this blog I’ve discussed proteins that undergo significant changes in structure without drastic changes in their primary sequence or solution conditions. In some cases, a few mutations can take a protein to a novel fold, as with Philip Bryan’s protein G work. In others, closely related sequences within a whole family populate different kinds of folds, as Matt Cordes illustrated for the case of Cro proteins. In addition, there are some cases such as lymphotactin, where interconversion between two very different structures takes place at equilibrium, as illustrated by Brian Volkman’s research. Each time stories like this come up I have mentioned that this kind of behavior (termed “metamorphism” in a 2008 commentary by Alexey Murzin) suggests a means by which proteins could evolve from one structure to another without losing foldedness or function. Recently, a group from the Weizmann Institute published results in PNAS that speak to this possibility. Yadid et al. 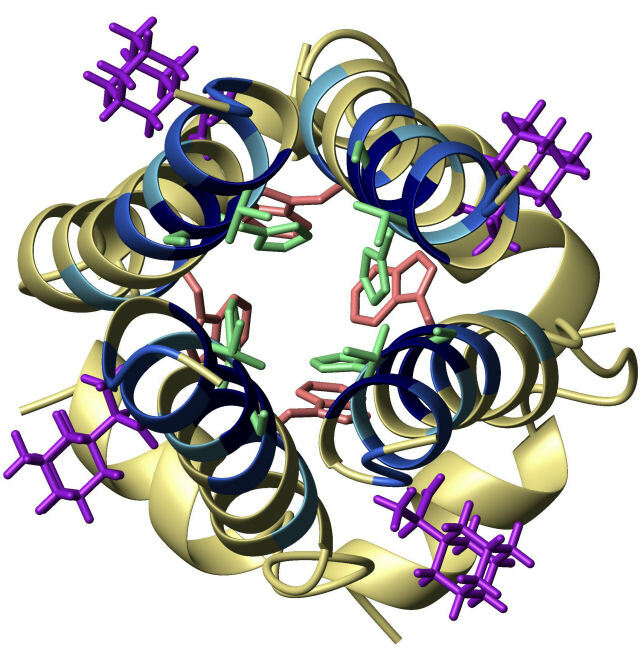 are looking at a class of proteins called β-propellers. Characteristics of the sequences of these proteins, especially high homology between different blades within a protein, suggest that these proteins are “built up” by gene duplication and fusion from precursors that were either multimeric in nature or made from a smaller number of blades (or both). In particular, they worked with a protein called tachylectin-2, that binds sugars. You can see its structure at right (or examine it at the PDB). The color-coding recognizes that the N and C termini are adjacent to one another, meaning that each “blade” of the propeller actually incorporates one strand from a neighbor. The whole protein is a bit under 250 residues in size. Previously, the authors of this paper had randomly chewed up the tachylectin-2 DNA from either end, a process that one might expect would produce a bunch of useless garbage. Some of the products of this experiment, however, were functional pentamers. But, they were about 100 amino acids long, suggesting that each monomer incorporated two blades. 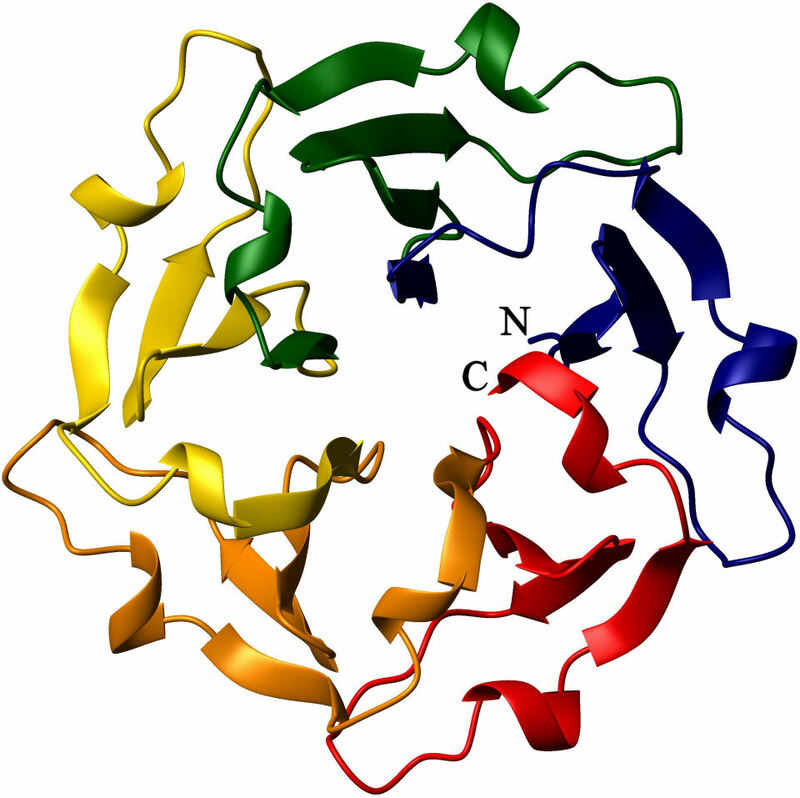 This meant that the structure of the pentamers had to differ from that of the original protein in some key way, but the proteins could not be crystallized due to low yields and instability. To solve this problem, Yadid et al. performed directed-evolution refinement of the sequences of two promising candidates. From the pool of proteins thus produced they were able to crystallize two, which had interesting properties. As one might expect given the known data, both these proteins formed ten-bladed propellers (the structures have PDB codes 3KIF and 3KIH) in the form of two five-bladed propellers that were linked to each other. 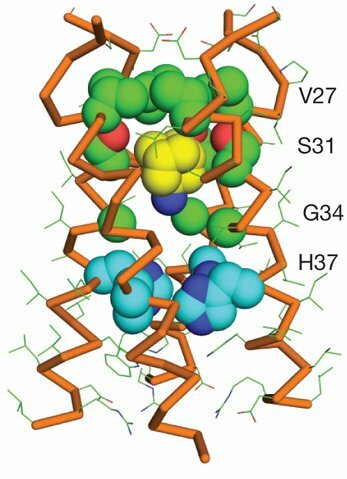 In the case of the mutant called Lib2-D2-15, 3 of the 100-residue subunits contributed two blades to the propeller apiece, while the remaining two monomers each contributed to three blades. That doesn’t add up to 10 because each of the two oddballs contributed four strands to one blade, three strands to another, and one strand to the third. That means one blade was uniquely of that monomer and the other two were shared. One of these blades was shoved into the second propeller, generating an asymmetric pentamer. Note also that the two oddballs weren’t equivalent: one was arranged 4-3-1 and the other 3-1-4. The other mutant, Lib1-B7-18, was even weirder in some ways. In that mutant, four of the monomers contributed to three blades in a 1-3-4 manner. The last monomer, however, contributed to four blades, two from each propeller, with a pattern of 1-3-1-3. Because these structures cannot form unless the monomers adopt multiple structures (3 in the case of Lib2-D2-15 and 2 in the case of Lib1-B7-18), it follows that the monomers must be metamorphic. The evolved fragments didn’t have higher stability to guanidinium hydrochloride than the source fragments, suggesting that the improved expression and solubility was not due to improved stability. The authors argue that the improved expression was mostly due to a change in the isoelectric point of the mutants, which decreased towards neutral in both cases. However, the evolved fragments also were able to refold from the denatured state, which the source fragments could not do. To the authors, this suggests that the directed evolution process actually selected for metamorphism; that is, the proteins were stabilized by an increased ability to sample states that formed productive pentamers. The observations in this study, although very interesting, do not tell us anything directly about the evolution of tachylectin-2. While it is possible that the current protein evolved from a metamorphic precursor like these fragments, there is no direct evidence that this is the case, nothing to indicate that evolution performed in reverse what Yadid et al. did here. Whether metamorphism contributed to the diversity of β-propeller folds in general, or to the evolution of this protein in particular, remains very much an open question. The metamorphism observed here may be more a consequence of a particularly robust fold tending towards its original state than evidence of hidden metamorphic potential in singular structures. As such, the article’s title strikes me as overbold given the data. 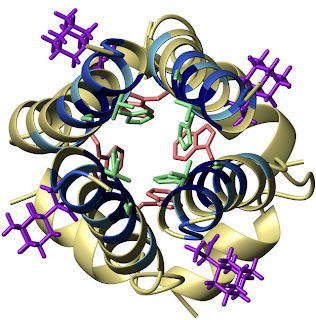 That said, it is certainly not implausible that odd assemblies like these pentamers played a role somewhere along the evolutionary path that created the rich library of β-propellers we have today, and this study establishes that even very strange steps along the way can occur without destroying the protein’s function or certain gross features of its structure. Anfinsen’s dogma — that the amino acid sequence of a protein uniquely determines its structure — naturally leads one to the idea that identity between amino acid sequences means identity between structures. This has proven to be a successful paradigm: sequence similarity reliably predicts structural and functional similarity. Evidence accruing in recent years, however, suggests that for small proteins, at least, this assumption may not be entirely safe. Adding to this view, in an article in PNAS this week (it’s open access, so open it up), a research team led by Philip Bryan reports that they are able to generate significantly different folds with divergent functions from sequences that differ by a single amino acid. The researchers in this study took two independently folded domains from streptococcal protein G that have different structures and sequences, called GA and GB, which bind human serum albumin (HSA) and part of an antibody (IgG), respectively. As you can see from several figures in this paper, GA has an all α-helical structure, while GB has a helix and a four-strand β-sheet. In previous papers they have undertaken a process of slowly mutating these two domains towards each other, most recently generating a pair of proteins they called GA88 and GB88 (which I have mentioned before) that retained their original structures and functions despite differing in their amino acid sequence at only seven places (i.e. they were 88% identical). Beyond this point, mutating the sequences towards each other causes the protein stability to degrade. However, they manage to complete the project by generating sequences that are 91, 95, and 98% identical while retaining much of their original function. GA98 and GB98 differ only in the identity of the amino acid at position 45, which is leucine in GA98 and tyrosine in GB98. 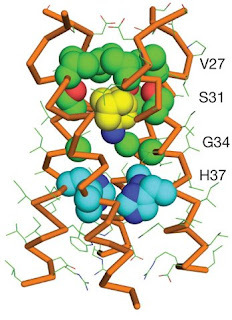 The tyrosine seems to be critical in stabilizing a hairpin turn in the GB structure, possibly by interactions with an adjacent aromatic residue (F52 – see Fig. 6). 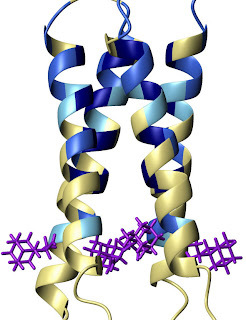 In the structure of the GA95 protein (Fig. 5), L45 is partially solvent exposed, and therefore probably does not contribute substantially to stability. Of course, as a leucine is also hydrophobic, one might expect that it would also interact favorably with F52. This seems to be the case, as the GA98 protein binds to both HSA and IgG, suggesting that it transiently samples the GB structure. 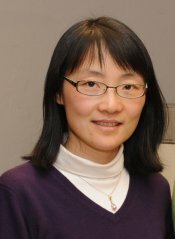 As with studies I have talked about previously on lymphotactin, which has two structures in its native state, and the cro proteins, which can have different structures despite similar sequences, this research indicates that the relationship between sequence space and fold space may not be as straightforward as previously believed. We have known for some time that distance in sequence space does not imply distance in fold space — the convergent evolution of numerous proteins has shown us that, at least. These experiments inform us that distance in fold space need not imply distance in sequence space, that it is possible for a protein to undergo a structural saltation in which a single mutation gives rise to a dramatic difference in structure. It remains to be seen whether this is true in larger proteins as it seems to be in small proteins and domains. 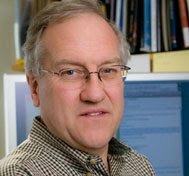 If it is generally the case that proteins can drift towards new folds without losing their native function, then “jump” over to a completely different structure, without transiting the molten-globule state, then our understanding of evolution, particularly early evolution, may change significantly. For instance, the objection that proteins could not evolve new functions without wandering into the unfolded state loses its weight. Moreover, given that in two of these cases the proteins actually sample both structures (and hence, both functions), it is not even necessarily true that a protein must lose its original function before evolving a new one. Equilibrium switching between structures would allow a protein to fulfill both the old and new functions, albeit likely at reduced efficiency. As I’ve mentioned before, one answer to this lack of efficiency would be altering protein concentration by adjusting gene dosage, i.e. gene duplication. From that point, the generation of fold and functional diversity by evolution might be a straightforward process.